The Operator on Delta Radio was called Marby Mulligan and his debute on short wave was Saturday the 28 April 1973. The last show on air was beamed out the 1 September 1974. The normal frequency was 6230 and the programs last for 45 minutes and later when Delta started to broadcast for Europe , the time was increased to one hour. The reason why Delta had chosen Saturdays as broadcasting day was to fight with Radio Tiffany International about the listeners, and Radio Tiffany had just began on SW at this time. 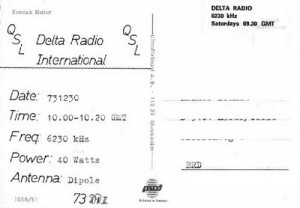 Delta used free frequencies between 6227 – 6285 kHz. The day before Delta quit, the Dutch Off-Shore stations had closed down for a while, so Mulligan lost his interest in radio. Delta used around 30 watt and used a 2 x 12 meters dipole antenna. Delta have been called “Sweden’s third pirate station”.